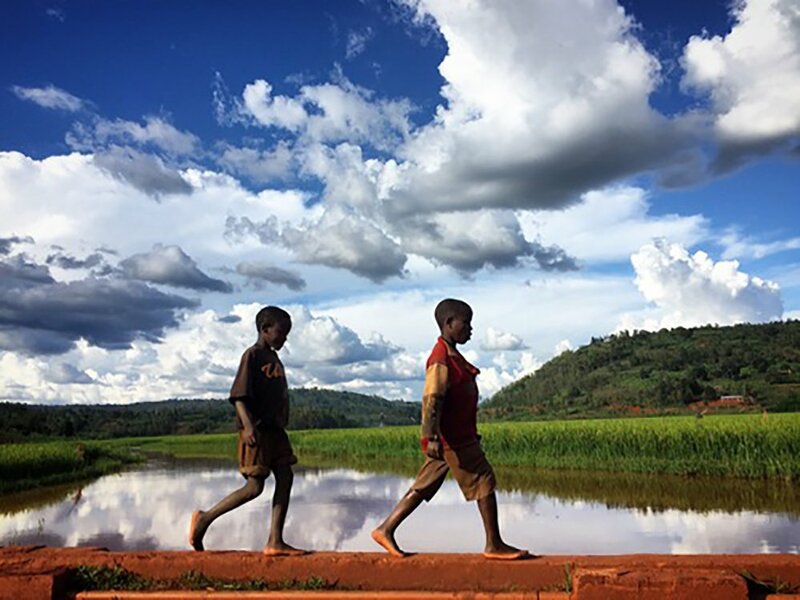 Alexis and Sylvian, both age 10, walk next to rice fields that are, in part, being blamed for the surge in Burundi’s malaria epidemic. ABOUT 10 years ago I was lying on the floor of a Nairobi airport, feverish, convulsing and barely conscious. Through a haze my cameraman travelling partner approached me with a wooden black cross. I had contracted malaria, and in my state of mind the only thing I could imagine was that he was about to give me my last rites. Next day it did and I arrived home looking and feeling fine, to the surprise of my wife, Merridie, who had last spoken with me when I was in the depths of disorientation. I was one of the lucky ones. In such a short period of time I had felt the full brunt of a disease that steals the lives of almost 500,000 people each year — and the full strength of our medical ability to overcome it. This week global health practitioners, world leaders in medical research, and development experts will descend on Melbourne for the first Malaria World Congress. Their conference may not make headlines, but when — not if — they succeed in their aims, we will remember this moment as a catalyst in the mission to eradicate malaria. Just 200 years ago malaria was rampant, occurring in almost every country on earth. Since 2010, increased investment and attention on eradication has led to a 29 per cent reduction in malaria mortality rates globally. Yet, recently we’ve taken our foot off the pedal. As malaria eradication has dropped off the radar, the number of new infections has increased: up five million cases from 211 million in 2016. A child dies from malaria every two minutes. With that in mind, this week’s Malaria World Congress could not come soon enough. That Australia is the host is an encouraging sign of our willingness to convene and lead efforts in our region and around the world. According to the World Health Organisation, our region carries the second largest burden of ­malaria. In our backyard there are 28 million cases of malaria annually, resulting in 45,000 deaths, many of them children. Leading the eradication of malaria is the right thing to do. Living in the land of the fair go, there wouldn’t be an Australian who can’t see the plain and simple unfairness that a few hours north of Darwin, in places like Papua New Guinea, the bite of a mosquito is so much worse than just a nuisance. Organisations such as World ­Vision play a big part in saving lives by providing mosquito nets and disrupting insect breeding grounds in vulnerable communities. When we have the resources, the knowledge and the opportunity to prevent the spread of a disease, we must choose either to act or to ignore the very essence of our national morality. Australia’s expertise gives us the chance to medically lead the campaign. It is the smart thing to do. A wealth of research shows the economic cost of the disease to malaria-endemic countries. With our influence in the Pacific and our trade growth in Southeast Asia in the spotlight, there is a direct line from reducing the impact of the disease to building a shared prosperity. But more than that, Australia still bears its own scars of malaria. It’s written on gravestones in the Northern Territory. It’s written in the medical records of our soldiers in the Pacific, including my father, who contracted the disease while fighting the Japanese in PNG during World War II. Australia has been malaria-free for less than 40 years, and the one species of mosquito that harbours and spreads the disease, the anopheles mosquito, is still found in the Northern Territory. Add to that the rise of drug-resistant ­mutations, and we would be myopic to ignore the threat. Leading the eradication of malaria is also the Australian thing to do. Australia has led in medical interventions. We led the world to medical penicillin, electronic pacemakers, cochlear implants and the HPV vaccine. Just this year the Murdoch Children’s Research Institute in Melbourne invented an oral rotavirus vaccine administered in the first few days after birth. This provides protection from dehydrating diarrhoea that each year kills 215,000 children under five globally. With this history, it’s no wonder Bill Gates describes leadership on malaria eradication as “a natural role for Australia”. I am proud we are a country with a big heart, willing to chip in without asking what’s in it for us. We help. We volunteer. We give. We don’t sit by when there is work to be done, neighbours to help and suffering to be eased. Recent cruel cuts to the Australian aid budget have driven our investment in this global community to historic lows, but I have been heartened to see a boost in funding for malaria eradication. I am also encouraged by Australia’s role in establishing the Asia Pacific Leaders Malaria Alliance and by Foreign Minister Julie Bishop, who has called for an increase in our aid budget, stepping up to join Gates’s End Malaria Council. In turbulent times, we should take heart that the world can truly be rid of malaria in our lifetime and that we are ready to take the lead, starting this week. Written by Tim Costello, Chief Advocate of World Vision Australia.